On the 4th of December 2010, on the third of 3 sell-out shows at the Oslo Spektrum in Norway, the curtain will finally fall on a-ha’s glittering 25-year career. Undoubtedly a sad day in the calendar, but this hugely talented trio will be bowing out on a high note. Last year, in Foot of the Mountain, they released one of their finest albums, proving it was possible to be both contemporary and retro. This year, fans have been rather spoilt: Comprehensive 2-CD remasters of their first two albums (Hunting High and Low and Scoundrel Days), an updated version of Jan Omdahl’s insightful book The Swing of Things, a brand new single, and now this compilation album. 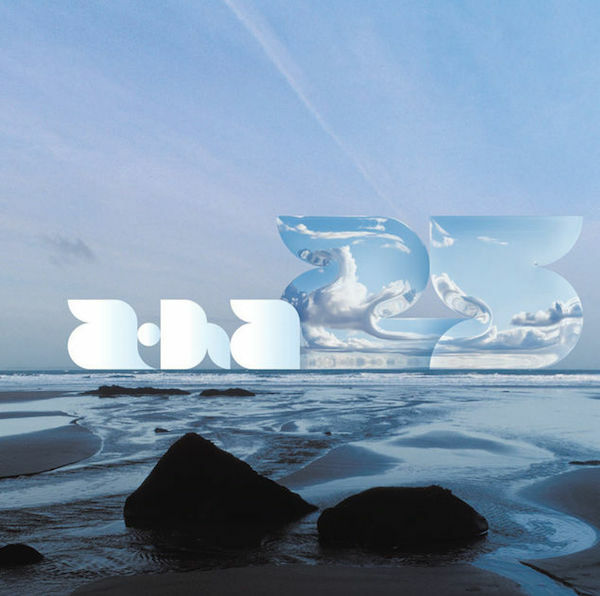 25 is actually a-ha’s third compilation album, following 1991’s Headlines and Deadlines and The Definitive Singles 1984-2004, but this is easily the most comprehensive, and it has been lovingly put together by reissue specialists Rhino Records. The only gripe I have is the band’s chunky new logo on the aquatic cover, but this doesn’t detract from what is a highly recommended retrospective. Across the two discs, every remastered track (including some rare radio edits and mixes of singles) has been presented in chronological order, with the exception of ‘The Blood that Moves the Body’ – this remix was used to further promote Headlines and Deadlines in 1992, and appears here for the first time in album format. Fan (and band) favourites ‘The Blue Sky’, ‘The Swing of Things’, ‘There’s Never a Forever Thing’ and ‘Slender Frame’ have also been added, giving further weight to the claim that a-ha were more than just a singles act. Each of a-ha’s nine studio albums are well represented here, allowing listeners to trace their musical development. It took a few albums for a-ha to shrug off their poster-boy image, but below the surface of their catchy, intricate melodies lies a melancholic depth that has won them many admirers over the years, including bands such as Keane and Coldplay. In the early ’90s the band moved away from their trademark pop sound, and their ’60s influences (The Beatles and The Doors, in particular) were certainly more prevalent. By 1993’s Memorial Beach, guitars were at the forefront of the instrumentation and the material steered more towards the American market. Fast forward to the new millennium and the end of a-ha’s `seven-year-itch’, and the newly focused trio were a slightly more democratic affair; less reliant on the creative tension between Paul Waaktaar-Savoy and Magne Furuholmen, and utilizing more of Morten Harket’s lighter material. There were, arguably, mixed results over three albums and, by 2005’s deceptively-titled Analogue album, they were once again flirting with a rockier sound. For many it’s the end of an era, but there is still much to look forward to from each of this loveable band’s component parts. As Harket remarked on the end of a-ha: “It turns into a positive thing – the three of us are still around.” A capable songwriter in his own right, he has to date released four solo albums (two sung in his native language), while Furuholmen has recorded two solo albums, composed film soundtracks, and carved out a successful career as an artist in tandem with his musical commitments. Waaktaar-Savoy, a vastly talented and prolific musician and songwriter, has already released 6 albums (including one compilation) with his side-project Savoy since 1996, and a new album is reported to be in the works.